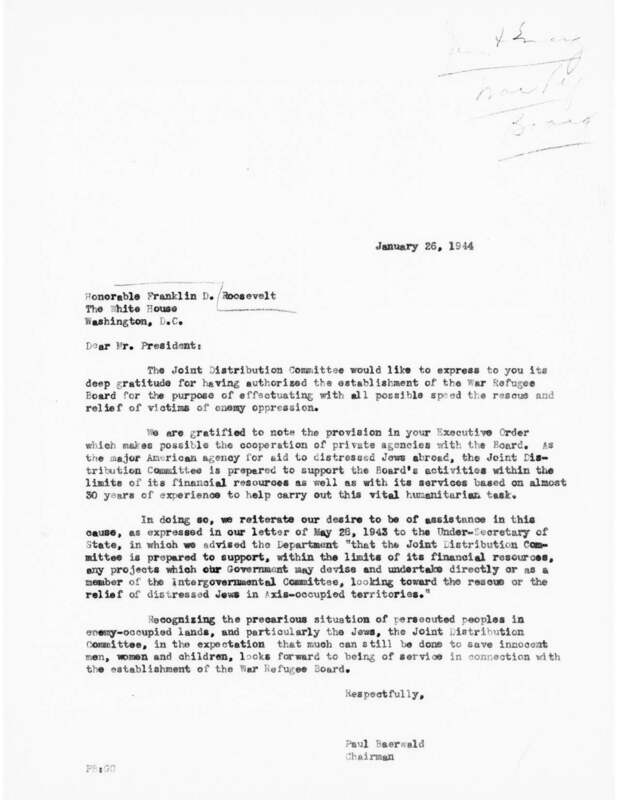 On January 22, 1944, President Roosevelt issued an Executive Order establishing the War Refugee Board (WRB) which declared, “It is the policy of this Government to take all measures within its power to rescue the victims of enemy oppression who are in imminent danger of death and otherwise to afford such victims all possible relief and assistance consistent with the successful prosecution of the war.” The WRB was the U.S. Government’s formal response during World War II to the systematic persecution of millions of innocent people in Nazi-occupied Europe. 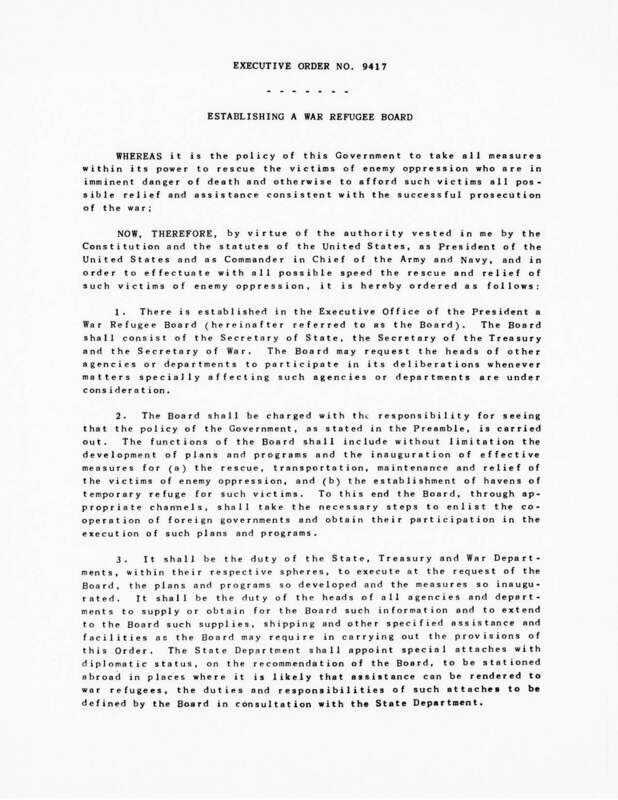 The WRB reported directly to the President and consisted of the Secretaries of State, Treasury, and War. 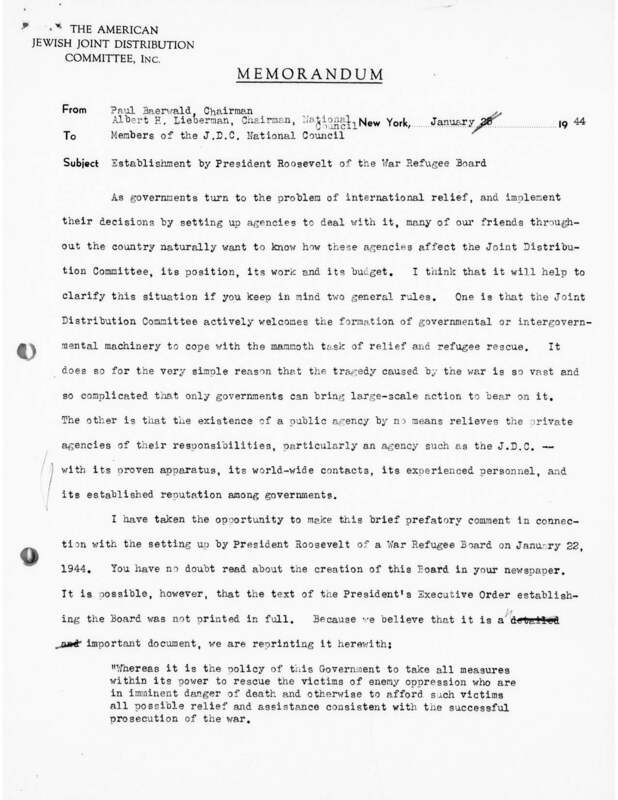 Led by Executive Director John Pehle, the Board enlisted the help of JDC and many other Jewish, Christian, and non-sectarian organizations in the United States, including the Vaad Hahatzala Emergency Committee of the Union of Orthodox Rabbis, the National Refugee Service, and the Unitarian Service Committee to carry out rescue and relief programs abroad. 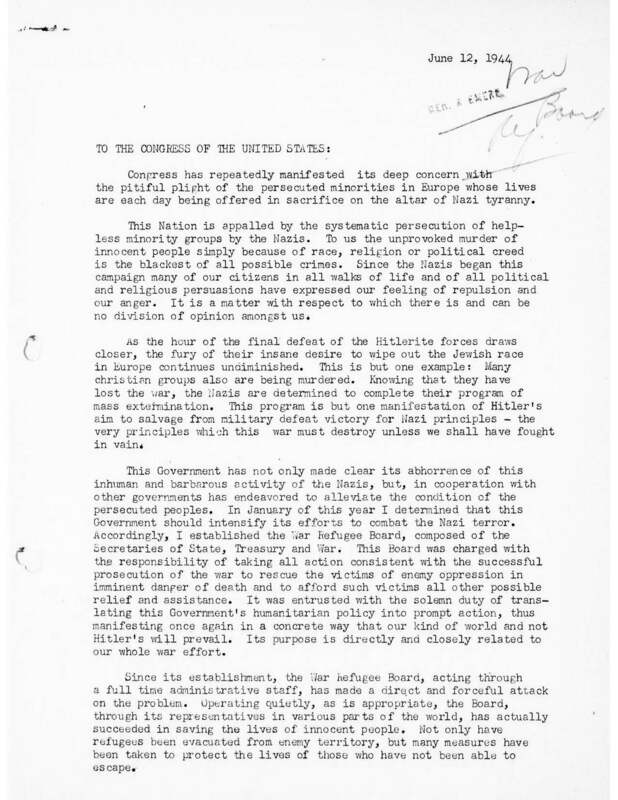 One of the WRB’s most important functions was to enable these private agencies to send funds into enemy territory (with government permission). Of the $20,000,000 in private funds that were licensed by the United States Treasury for these purposes, JDC provided the majority of the funds, approximately $15,000,000. JDC staff members, including European Chairman Dr. Joseph J. Schwartz and Secretary Moses A. Leavitt, offered their expertise as advisers to the Board. 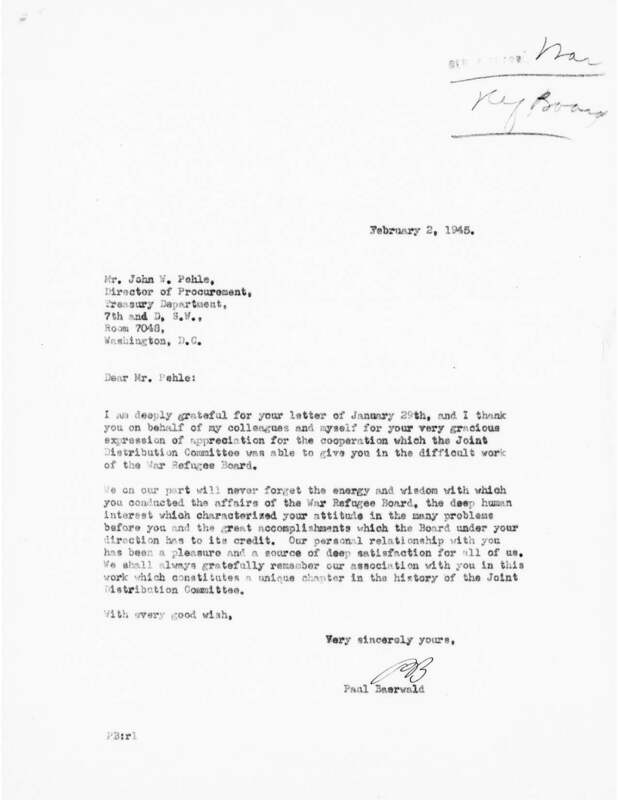 These funds helped finance the rescue of Jews in Nazi- and Axis-occupied territories. Efforts included the evacuation of about 7,000 Romanian Jews to Palestine via Turkey between 1944 and 1945, largely financed by JDC, as well as the rescue operations overseen by neutral diplomats such as Raoul Wallenberg and Carl Lutz in Nazi-occupied Hungary. 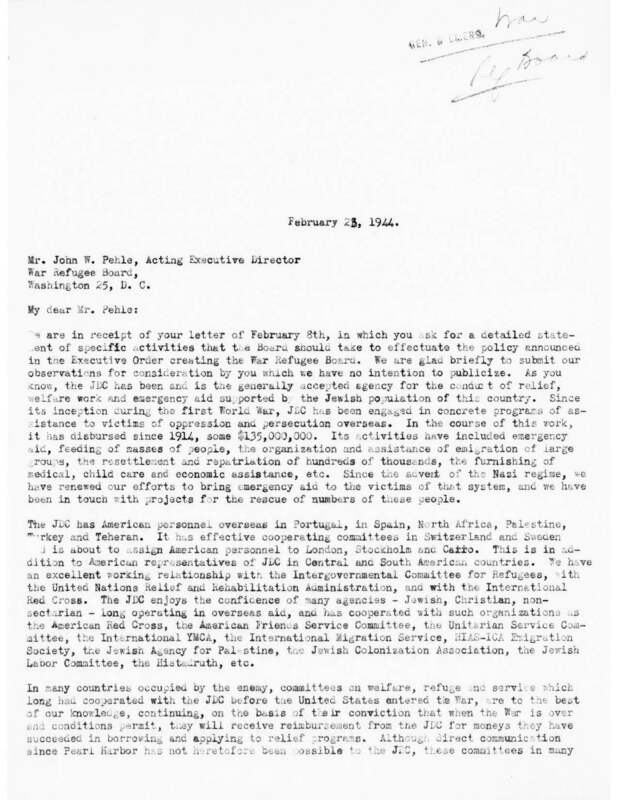 Saly Mayer, JDC’s Representative in Switzerland and former President of the Swiss Jewish Community, worked closely with the WRB in Switzerland, forming key connections with neutral embassies in Switzerland and with the International Red Cross, who then transmitted aid to Jews in Axis-controlled countries. 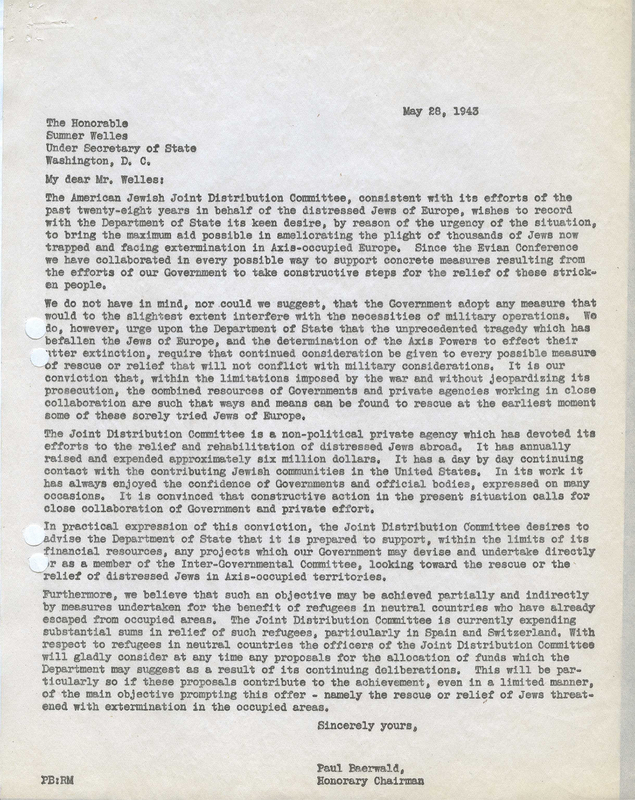 JDC advocated for better conditions for the internees of Nazi camps and the provision of relief aid until they could be liberated. 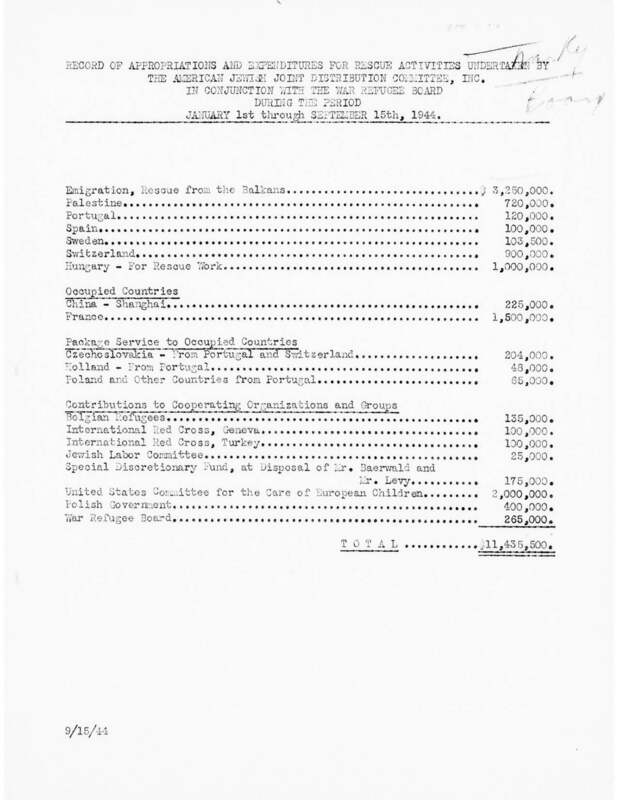 With the aid of the U.S. Army and the International Red Cross, the WRB shipped 600,000 food parcels to various concentration camps; the costs were shared by the U.S. government, JDC, and other voluntary organizations. 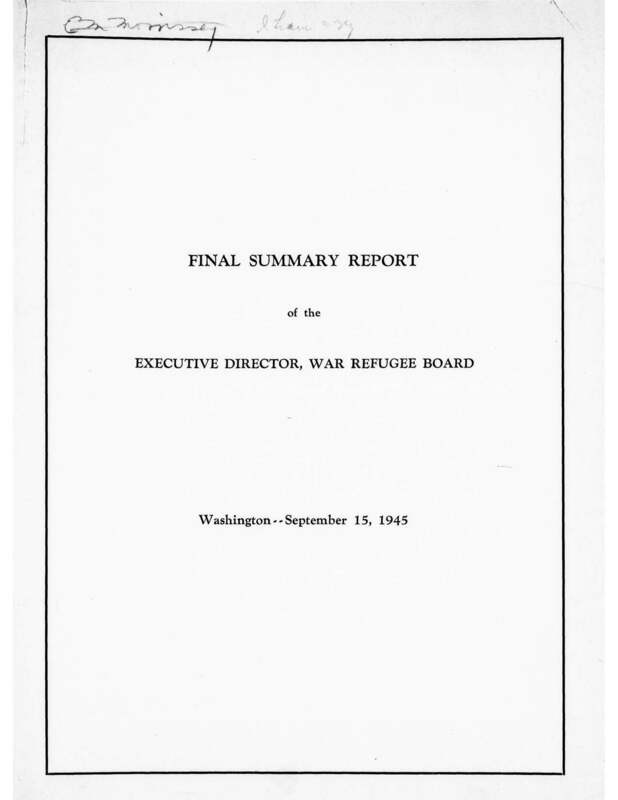 When the war in Europe ended, so did the assignment of the War Refugee Board. In the Board’s nearly two years of service, almost 200,000 Jews were rescued through its efforts. 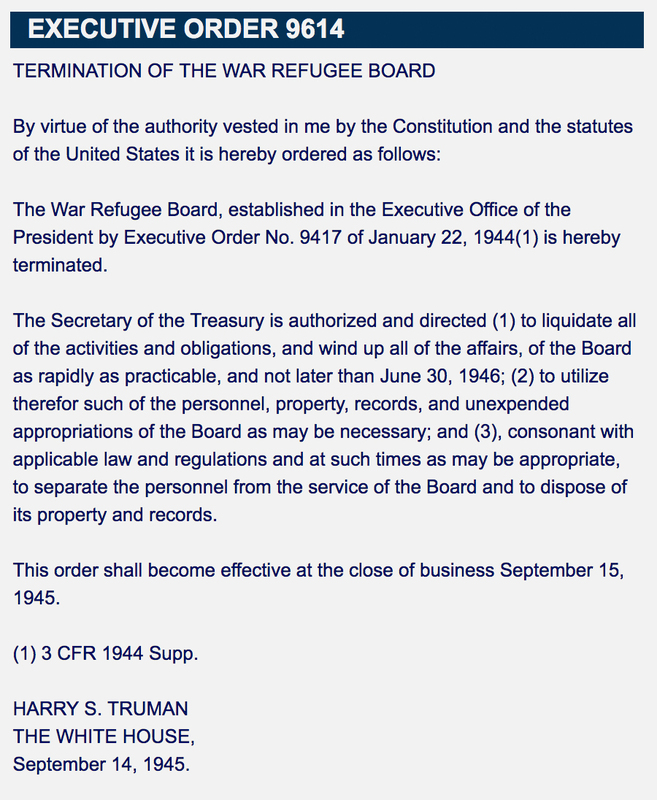 The Board was dissolved by President Truman’s Executive Order 9614 on September 14, 1945. Agar, Herbert. The Saving Remnant: An Account of Jewish Survival. New York: Viking Press, 1960. American Jewish Joint Distribution Committee, Henry Friedlander, and Sybil Milton, gen. eds. 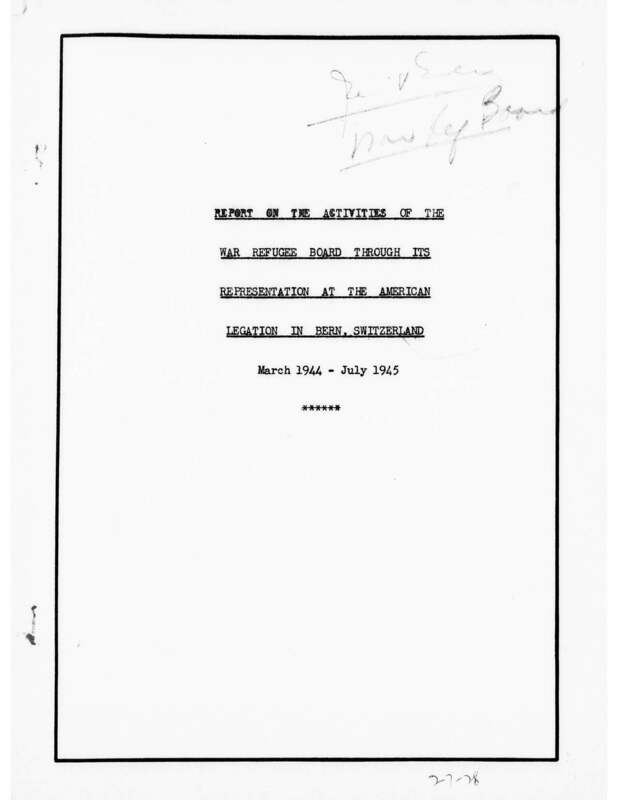 Archives of the Holocaust: An International Collection of Selected Documents, vol. 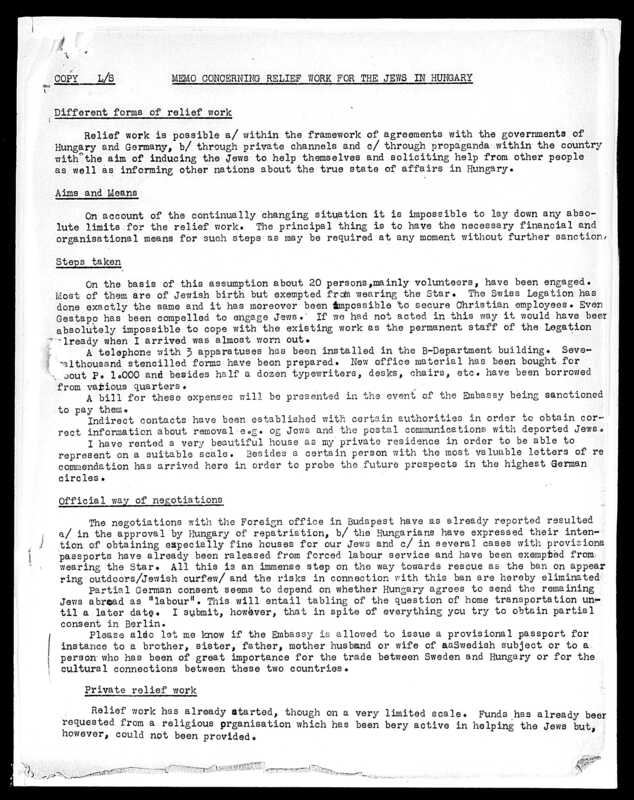 10, parts 1 and 2. New York: Garland Publishing, 1995. Bauer, Yehuda. Out of the Ashes: The Impact of American Jews on Post-Holocaust European Jewry. Oxford: Pergamon Press, 1989. Mankowitz, Zeev W. Life Between Memory and Hope: The Survivors of the Holocaust in Occupied Germany. New York: Cambridge University Press, 2002. Patt, Avinoam J., and Michael Berkowitz, eds. 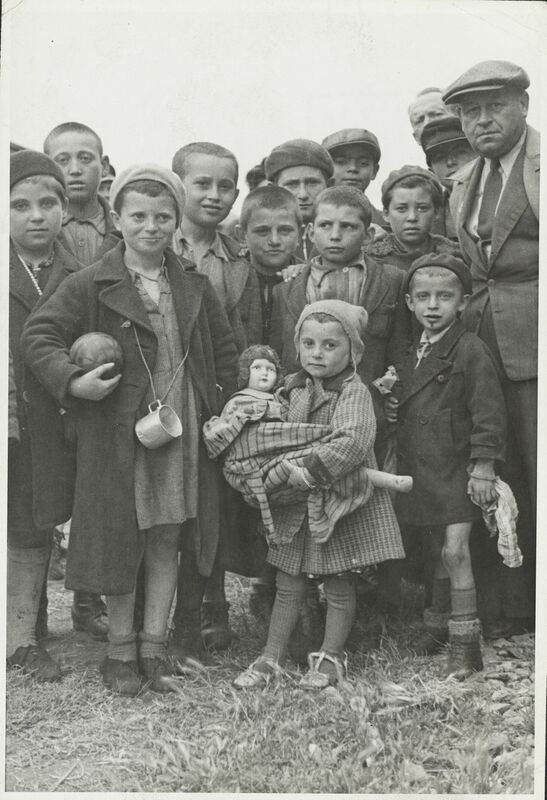 We Are Here: New Approaches to Jewish Displaced Persons in Postwar Germany. Detroit: Wayne State University Press, 2010. Warhaftig, Zorach. 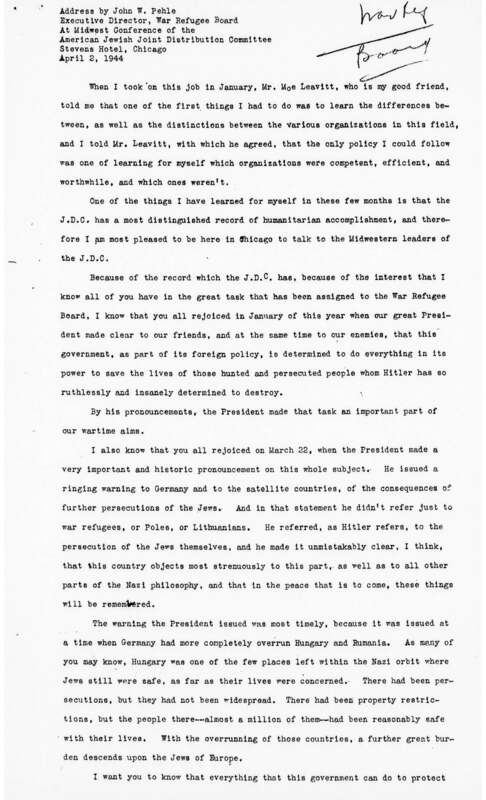 Jewish Refugees and Displaced Persons after Liberation. 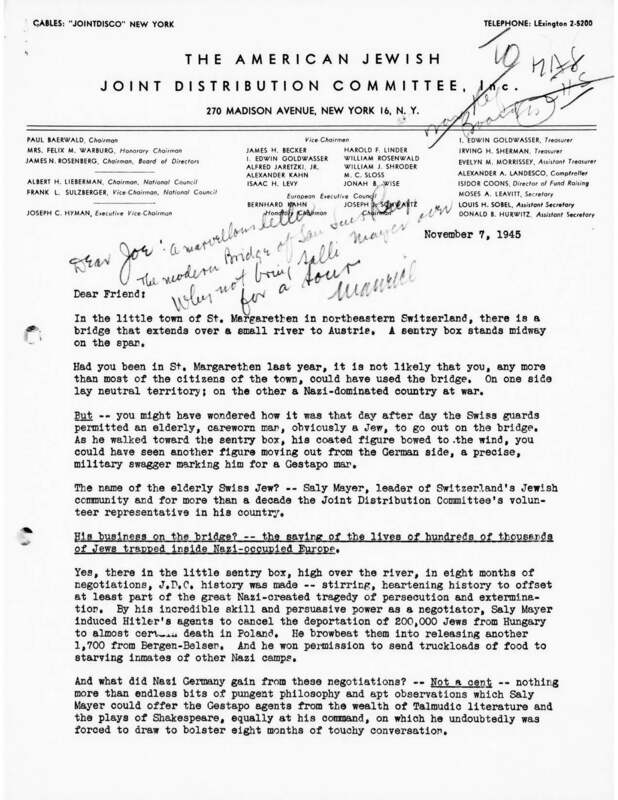 New York: Institute of Jewish Affairs, 1946.